January 11, 2018-The Eastern New York Youth Soccer Association (ENYYSA) is very pleased to announce that Andy and Marlene Kasman have been selected as our Personalities of the Month for January. The Dix Hills residents have been volunteering for the Commack Soccer League in the Long Island Junior Soccer League (LIJSL) for more than two decades. Andy became involved with soccer after the family moved to Dix Hills and their son Brian, who was four, wanted to play. They missed the registration so Marlene spoke to the coordinator who said he had enough kids to make a peewee team but no coach. He said if Andy wanted to coach, their son could play. That was the humble beginning to Andy’s coaching career. Marlene became involved because every Sunday, Andy and sons Brian and Jonathan were spending all day at the field playing, volunteering and refereeing, so she volunteered to help and subsequently became involved on the Commack Soccer League’s Executive Board. Andy coached the LIJSL’s Commack Strikers, taking Jonathan and his teammates up to Boys-Under-17. Additionally, Andy volunteered as an age group coordinator for Commack while Marlene served as Commack’s Referee Coordinator for seven years. Commack TOPSoccer players. Andy and Marlene Kasman are on the far left in photo. As their sons were getting older and no longer playing, Marlene was looking to do something to stay involved in the Commack Soccer League, where they had made many friends, yet also to give back to the community. 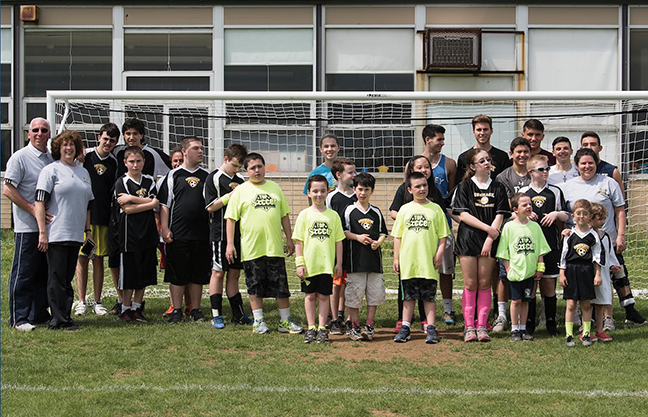 A friend’s son was playing soccer for the neighboring Huntington Boys Club’s TOPSoccer Program because Commack never had a program for these children with special needs. After doing some research, getting approval from the Executive Board of the Commack Soccer League and meeting with the LIJSL TOPSoccer committee, Andy and Marlene introduced the program to Commack in 2009. 40 kids, both boys and girls, currently play Commack TOPSoccer on Saturday mornings at 11 am at the Burr Road Soccer Complex during the spring and fall. Additionally, the Kasmans have organized a TOPSoccer Spring Tournament for the past two years with the third edition coming in 2018, which is completely supported by the Commack Soccer League and the LIJSL TOPSoccer Committee.